When an opponent's monster activates its effect while you control a "Krawler" monster: The activated effect becomes "return 1 face-up monster your opponent controls to the hand". 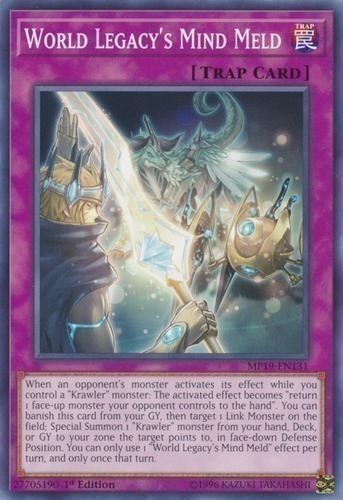 You can banish this card from your GY, then target 1 Link Monster on the field; Special Summon 1 "Krawler" monster from your hand, Deck, or GY to your zone the target points to, in face-down Defense Position. You can only use 1 "World Legacy's Mind Meld" effect per turn, and only once that turn.